Strawberry, anyone?! - Triple Joys!!! Last Friday, July 22, 2016, in celebration of the Nutrition Month, students from different grade levels of SPARK Kids of Global City (the school where my daughters go to) were tasked to wear either a headdress or a costume showcasing different fruits and/or vegetables. 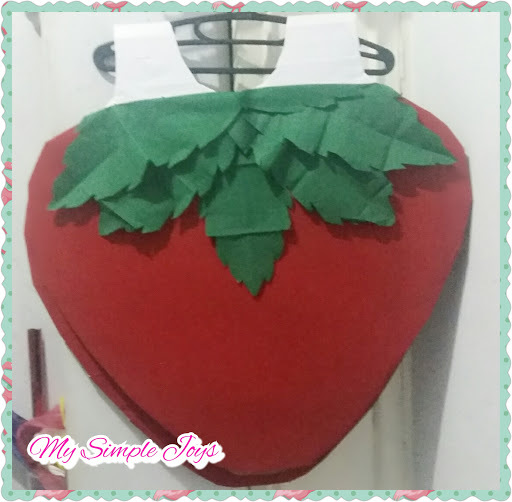 I browsed through the internet for some ideas and inspirations, and I decided to recreate this one - a Strawberry costume! As my daughter only advised me a day before about the costume "thingy", I opted for a costume that I can easily make, nothing grand as there was also no mention of any costume competition anyway. Yna with her classmates in their costumes. So, how to make a Strawberry Costume? As much as I really wanted to do a step by step instruction, with matching illustrations of of the procedures, unfortunately, I was not able to take photos as I was already fast asleep when hubby started to make the costume. :) So please, just bear with me and hopefully you can still be able to recreate this simple yet award-winning Strawberry costume (naks)! 1. Big carton (depending on the wearer's built). You can use either new or used ones. As for us, we used the box which previously contained our TV. 2. Red felt paper. You can also use red cloth but I really prefer felt paper because of its texture. 1. Measure the body size of the person who's going to wear the costume. The lenght should start from the shoulder upto the knee. But, actually, it depends really on how big the costume you really want it to be, it is really your call. And that same principle goes to the width of your costume too! :) Just make sure that the width is proportionate to the length of the costume. 2. Draw your pattern. Use a pencil so can easily erase your mistake, just in case. :) Make two identical patterns. 3. Cut your patterns into shape. 4. Cover your pattern with the red felt paper (or red cloth). Use double adhesive tape to secure the felt paper in place. 5. To connect the two patterns in order to look like a sando dress, you can make extensions similar to a sando. Cover the same with white sticker paper. But if you find this step a little hard to do, you can just connect the two patterns with a garter! Much easier, right?! 6. 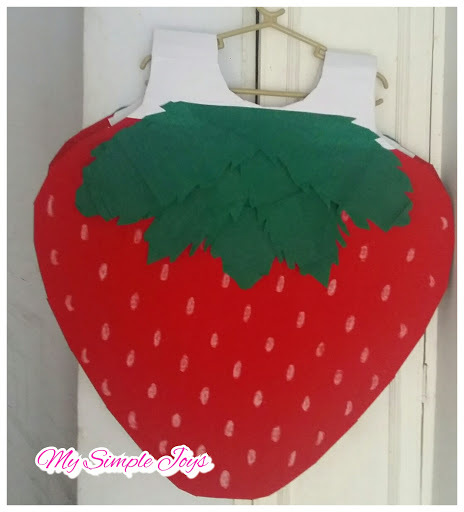 After connecting the two strawberry patterns, draw and cut some leave patterns using the green crepe paper. Attach the leaves to your strawberries. These leaves should serve as the calyx of your strawberry. 7. For the final touch, using a white crayon, draw the "seeds" or the "achenes" (which are actually the plant's ovaries), and your done! To complete the look, I had my daughter wear a red long sleeves blouse, black leggings, red sneakers, and yellow green socks. I also put green ribbons to her pony tails (not seen in the photo below). And here is the complete look! Very easy, right?! Pag Mommy talaga you'll do everything for kids. Kudos Mommy Josephine for making that strawberry costume. Congrats for winning little girl! Galing! Super cute pa, congratulations! Hmm.. I wonder what her costume will be on Halloween! such a cute costume! gayahin ko ha, pwede? Oh cool! I love DIYs! I've been seeing a lot of nutrition month posts lately with kids in their costumes. Excited for when my toddler starts asking me for costumes na! Haha! I love doing everything DIY. Your daughter is pretty. Congrats on winning . Can't wait to do this with my son when he'll go to school too. Haha, most of the times, mas excited pa tlga mga mommies kesa sa mga kids nila! Thanks sis. Great DIY tips for this! Well, the end product was amazing and suits your daughter too! She looked lovely and so proud! Haha nanalo pa rin, congratulations! I think it's because it's unique. And kudos to your husband for such a well-made costume. Ang galing! Congratulations! I love her strawberry costume. She deserves the award dahil syempre galing sa effort ni Mommy. Ang sarap ng feeling if we are able to create stuff for our kids no. Lalo na if they get to wear them. Your daughter looks so adorbs on that last pic! :) Galing naman! It's good that your husband was able to get it done. I don't think I can count on my husband to do such a thing haha. Wow! Love the costume! And so galing tlaaga of the husband to help! My husband would help din naman kaso maglilitanya muna sya at magsesermon. Hahaha. Nice costume! And the designer was also good! Kudos to your husband for a job well done!